Perry Stormaire never suspected that the nerdy Lithuanian exchange student, Gobi Zaksauskas, who has been living with his family for the past nine months could be anything more than just a banal, mouse of a girl. But on the night he is forced by his parents to take her to the prom, he soon discovers that she is far from a nerdy exchange student, but instead a hired assassin! Forced to chauffeur Gobi all around Manhattan while she carries out her hits, Perry suddenly fears for this life and everyone in his family. Will he survive this night? Or will he be another one of Gobi's victims? 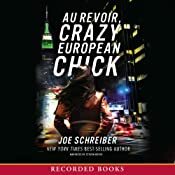 Au Revoir, Crazy European Chick is the perfect novel for reluctant guy readers. It was not written to be a literary work of art, but rather a fun, dangerous thrill ride that doesn't involve too much superfluous thought. Sometimes even the most literary of minds need books like that in their lives. As an added bonus, each chapter begins with a college admissions essay question from different universities around the country which relates to the chapter in some way. For that reason, this book could strangely be a great way to get teens to start thinking about college. Maybe teachers could even use all these admissions questions in one place as a way to get students thinking about what sorts of things they'll eventually need to write for their college applications. Steven Boyer is the narrator of the audiobook and he does an amazing job of bringing the story to life. His eastern European accents are flawless and he narrates the protagonist of Perry perfectly: just the right amount of teenage angst coupled with sheer fear, and finally attraction to his captor. If you've been in a reading slump, I highly recommend some fun, mindless brain candy in Au Revoir, Crazy European Chick.